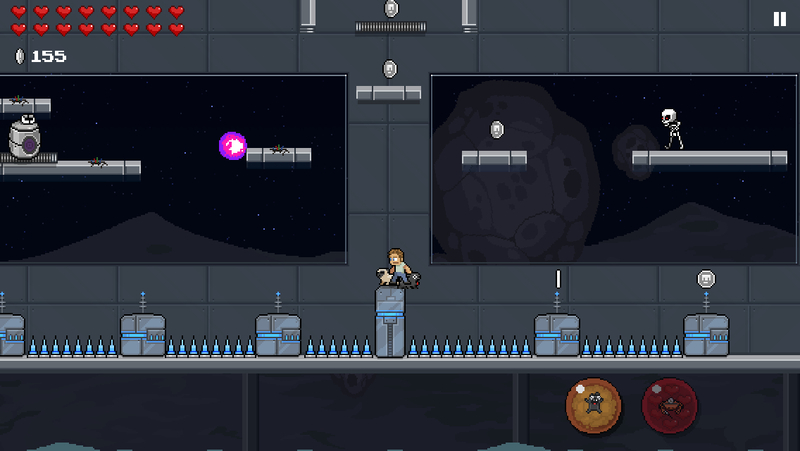 ‘PewDiePie: Legend Of The Brofist’ Review – If PewDiePie Plays PewDiePie’s Game, Will It Break The Charts? Like many popular figures, PewDiePie tends to get a mixed reaction. A whole lot of people love him. At least 39,743,403 people, at the time of writing this. A lot of people hate him. I’m sure some will stop by the comments down below. Then, there are people who have no strong feelings either way. Perhaps they’ve lived in Japan for a long time or something, I don’t know. Group A, you already bought PewDiePie: Legend Of The Brofist ($4.99). I’d bet you like it quite a bit, because there are a lot of jokes and references in the game that I haven’t got a hot clue about. That almost certainly means the fanservice is probably off the charts. Group B, you probably weren’t going to buy it anyway, but let me reconfirm it for you. This game is very PewDiePie, if I may create an adjective from whole cloth. If seeing or hearing PewDiePie drives you into a crimson-soaked rage, please do not buy or play this game. Group C, tiny a group though you may be, you’re probably the only ones reading this who are actually wondering whether or not to buy the game. My answer to that question involves lots of provisos, follow-up questions, and conditionals, which means that we will in fact have to go through with a full review and not just two paragraphs with a simple branching choice. Sorry. PewDiePie: Legend Of The Brofist is a side-scrolling platformer that has you playing as the world’s biggest YouTube sensation and, once you’ve unlocked them, some of his friends. The evil Barrel King has kidnapped all of your fans in an effort to seize control of the legendary Brofist. You’ll run, jump, head-bop, and dog-fart your way through 24 levels. For the most part, it’s totally run-of-the-mill platforming, but there’s one stage that plays out as a horizontal shoot ’em up, another that works a bit like the Turbo Tunnel from Battletoads, and a few that basically amount to arena survival. The levels run about a couple of minutes each at most, and there are three different difficulty settings you can play them on. Along with making the game harder, increasing the difficulty setting also yields more coins. Those coins can be used to increase a character’s health bar, unlock new characters, and open up new special moves. There are also patches hidden in each of the stages that you can collect. Oh, and if you manage to clear the game on the highest difficulty setting, you’ll unlock an even more difficult new mode. Each of the characters has access to different moves and plays a little differently, offering a bit of extra variety to the game. While the special moves are pooled between all of them, you’ll have to upgrade each character’s life bar individually. Full upgrading a character allows you to take a ridiculous number of hits, but you’ll certainly appreciate that buffer. There are a lot of hits in the game that feel a bit cheap due to the way enemies are placed and levels are designed, but the consequences of taking a hit or two aren’t very dire on most of the difficulty settings, so it’s largely forgivable. The touch-based controls work well enough. Though it’s a little odd to have buttons for special moves and not for jumping, you’ll be doing the latter more than anything else, so it’s nice to be able to just hit the right side of the screen and not have to fish around for a virtual button. The virtual stick used to move your character is pretty good, though I had some issues with it in precision situations. The level design and enemy placement call to mind Capcom’s 8-bit Mega Man games, and the presentation follows suit. It’s only odd in that PewDiePie has no projectile, instead limited to jumping on enemy heads or using a special attack every once in a while. 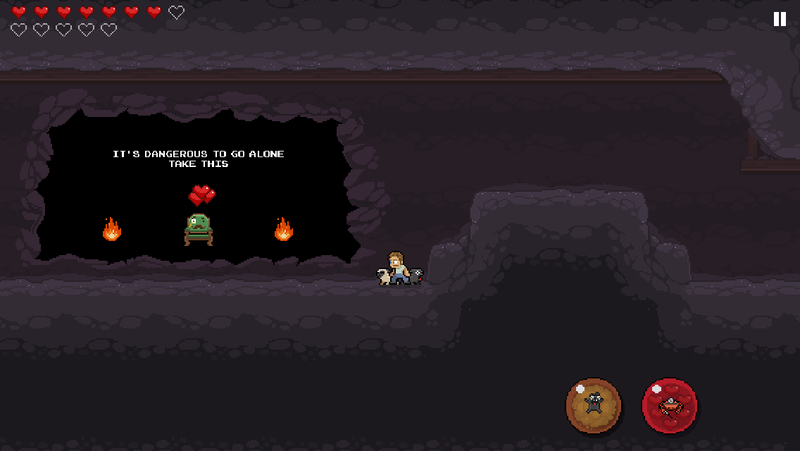 This can make it tricky to hit some of the enemies that will come after you in odd arcs or fire at you from a distance. The rhythm of the game feels a bit different from most 8-bit-style platformers, so you might eat a lot of damage until you can get yourself adjusted. Once you do, it’s a pretty fun game, similar in quality to a B-grade NES licensed platformer. There are just enough gimmicks to keep it from getting stale before the end of the game arrives, and the basic feel of the gameplay is sound. For the style of presentation the game is going for, it looks and sounds quite good. The animations are cute, the enemy sprites are nicely detailed, and there’s quite a bit of variety in the visual themes of each stage. The portraits of PewDiePie and his friends that appear during dialogues are quite well-done, capturing the personality of their subjects with only a few different variations for each. The music is good, and certainly has that immediate NES sound to it, though it’s not particularly memorable. As for the voices, the friends of PewDiePie that appear have voiced themselves, and I’m pretty PewDiePie himself handled everything else. It’s hard to comment much here since I haven’t seen too many of his videos, but the voices are all pretty consistent with what you’d see on his channel as near as I can tell. For those who don’t want to hear the voices, there is an option to turn them off, but they don’t really come up as often as you’d think anyway. The game’s sense of humor is random and bizarre, but I can dig most of it. There are lots of references to classic games, and plenty of things that are almost certainly in-jokes for fans. I’m sure there’s some reason why the cows seem to explode in a shower of hearts and gore, or why whales sometimes fall from the sky and die gruesome deaths, but I don’t need to know where it’s from to find it funny in a weird sort of way. As someone who doesn’t follow PewDiePie much, I had trouble getting some of the humor in the conversations that happened before and after each stage, but overall, a surprising amount of the game’s character still shone through. 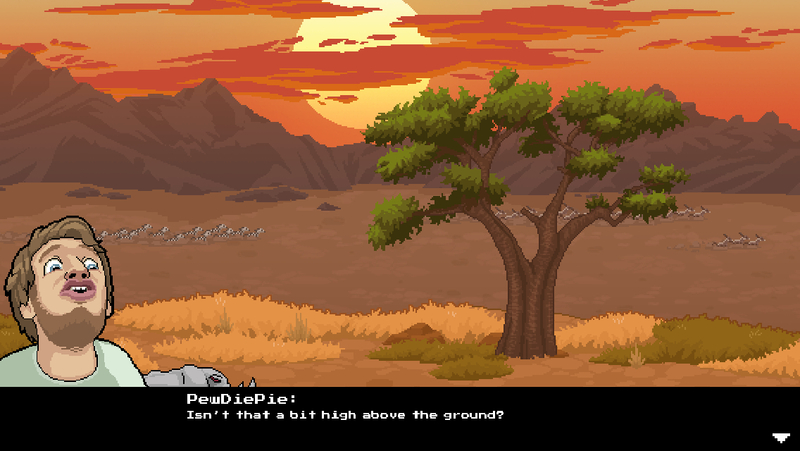 PewDiePie: Legend Of The Brofist is a solid game that is either elevated by its license or destroyed by it, depending on your feelings concerning its star. It’s the first part of that sentence that is important, however. This is, in fact, a solid game. It’s not particularly innovative, and iOS certainly has its fair share of well-constructed retro-style platformers, but this isn’t just a garbage cash-in. The game mechanics feel good, there are a lot of fun things to unlock and collect, and you can tell a lot of effort and resources went into the game’s presentation. The game is loaded up with fanservice both for fans of PewDiePie and classic games, and if you happen to like both, you’ll probably have a good time making your way through the game. The level designs are a little loose at times, and if you’re not interested in clearing every difficulty level or unlocking extras, it’s over a bit quickly, but overall, I think it’s a pretty enjoyable romp.